I’ve kind of been on a granola kick lately so when I saw this over at Something Swanky I was sold. You all know what a cookie/ cookie dough lover I am and I love granola, so this one was a no brainer. I made it and had it ready for my boys when they got home from school yesterday. They loved it, my husband loved it and of course, I loved it. It’s delicious and pretty much impossible to stop at just one handful. It’s so quick to throw together . . .easy peasy! The only thing I would do different next time is double the recipe because it didn’t last long. Preheat oven to 350 degrees. Line a cookie sheet with parchment paper or a silicon liner. Put the honey and the peanut butter into a medium sized microwave safe bowl. Microwave for 30 -45 seconds, until peanut butter is a little melted. Whisk until smooth and then stir in vanilla. 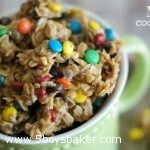 Use a rubber spatula to mix in the oats, making sure the oats are evenly coated. Gently stir in the M&Ms and chocolate chips. Spread the granola onto the prepared cookie sheet. Bake for 8 minutes. Let cool completely. Crumble into bite sized pieces. I would just like to say my kids (including my “adopted neighbor” child) love this recipe. So much for that I had to multiply it by 4 just to keep enough of it on hand to feed all 5 of them (and myself). So yummy & so addicting! Thank you so much for sharing! That makes me smile! We love this stuff too! It makes a great neighbor gift during the holidays. You can buy the mini M&M’s in red & green during the holidays to put in it and it looks great packaged in cellophane bags with ribbon. Thanks for the sweet comment!